In the following story, Jeff uses mindfulness skills garnered from his meditation practice and mindfulness training to successfully navigate his waves of fear and anxiety. "My wife, Mary, and I were invited by an old friend, Steven, to join his balloon crew at the annual hot air balloon festival...We said yes enthusiastically. Everything was fantastic for the first few minutes, as the ground fell away and I looked around, feeling the cool air and captivated by the spectacle of other balloons rising in the beautiful Albuquerque dawn. Then I felt the basket move sideways as the balloon caught a wind current. I looked down over the railing and saw the ground crew, the vehicles, buildings, everything, shrinking. Then I felt the first wave of fear. I wished I had stayed on the ground, but knew at that point there was no going back. The realization that I had to cope was actually helpful. There was no choice except to deal with the fear. There was literally no way to get relief until the balloon landed. I remembered that I did have many years of meditation experience and decided that I would likely need all of it! So I began to focus my attention very deliberately and sharply on the experience of my breathing. Just as I had been taught and had done in my own meditation practice over the years, I let the breath be just as it was and let the situation be just as it was. I directed my complete attention to the unfolding sensations of my breath, especially my outbreath. After just a few breaths, I noticed some relief. I was able to locate the feelings of fear in my body. I was able to breathe in and out with the fear, holding the sensations in the cradle of the breath. I was able to soften some around the sensations and the situation...I started to move about in the basket and began to take more interest in the ride. I rode quite a distance with fear that morning. In fact, fear came and went and came back again many times. But each time it came, I was able to meet it the same way, using awareness of the breath as an anchor and consciously breathing in and out with the unfolding experience. Through this practice of mindful breathing, I was able to change my relationship to the fear experience in a fundamental way. I was able to stop relating from the fear, or as the fear, and instead relate to the fear..."
Jeff's story is an excellent example of effectively utilizing mindfulness practices in real world situations. I have heard many many people tell tales of anxiety and panic in my office. Anxiety is part of life, yet when it hits- our first inclination is to think something is "wrong" because we are anxious. This could not be further from the truth. Feelings and sensations are part of life. They come and they go. It is only when we try to force them to go away that we get into trouble. Jeff stopped fighting against his experience and essentially surrendered to it; he began breathing through it. 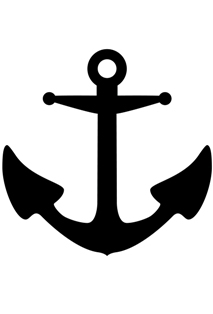 He remembered the ANCHOR - his breath. He surrendered & took control simultaneously in remembering and using this ever constant friend. Jeff Brantley's above experience was quoted directly - almost verbatim- from his book "Calming your anxious mind". This book is an excellent resource for coping effectively with fear, anxiety and even panic disorder. Dr. Jeff Brantley is the founder of the Mindfulness Based Stress Reduction Program at Duke University's Center for Integrative Medicine.